The grass snake (Natrix natrix) also known as the ringed snake or simply water snake is a non-venomous snake found in Europe, Asia, and Africa. They are a very adaptable species and can survive in very diverse climates and various habitats at many different altitudes. The several subspecies of grass snake are widely distributed in mainland Europe, ranging from southern Scandinavia to southern Italy and west from the Iberian peninsula to the east as far as the Lake Baikal in Russia. These snakes are also found in northwestern Africa and the Middle East. Grass snakes also inhabit lowland areas of Great Britain, being commonly found in south and southeast of England. It's far more uncommon in central Wales and almost absent from Scotland and absent from Ireland, according to the legend Saint Patrick expelled all snakes from Ireland. The grass snake preferred habitats include woodlands, grasslands, fields, and marshes preferably near water sources such as lakes, ponds, streams, and rivers. These snakes are very good swimmers often seen on the water with their head held up high out of the water, but they can also dive and hold their breath for 20 or 30 minutes. They also move very fast. Grass snakes are typically dark green, olive-green, brown or grayish in color, in colder regions of their range they are usually darker which presumably helps them thermoregulate. They have a variable row of darker colored stripes along the sides and sometimes a double row of smaller round markings is also present along the back. The belly is off-white, pale or yellowish in color covered with dark irregular, triangular or rectangular markings. Sometimes totally white (albino) or black (melanistic) specimens are found. The grass snake has a characteristic white, yellow, red or orange collar just behind the head. Which has earned them their other alternative common name of "ringed snake", in french "Couleuvre à collier" or Spanish "Culebra de Collar" and "Cobra-de-água-de-colar" in Portuguese. Even so in some individuals, this "collar" may be absent. Both sexes are generally very similar in appearance, even though grass snake females are very often much larger in both length and girth, males, on the other hand, have longer tails with a swelling at its base. Females can grow up to 2 m but on average reach 90 to 110 cms, while males reach a maximum length of about 80 cm with an average of 60 cm. Their common name, "Grass snake" is also used in North America but to identify 2 other completely unrelated species the rough green snake (Opheodrys aestivus) and the smooth green snake (Opheodrys vernalis). These small non-venomous are somewhat defenseless and apply a range of tactics to avoid predators. They may produce a foul smelling fluid, or even feign death, putting on a quite a show which includes becoming completely limp laying on their back, with a twisted head, open mouth, and their tongue sticking out. This is a behavior similar to that of other snakes species like the north american Eastern hognose (Heterodon platirhinos). They will even sometimes secrete blood from their mouth and nose. But if all fails they try to bluff their way out, performing an aggressive defensive display by hissing loudly and puffing while striking with a closed mouth. Grass snakes rarely bite in self-defence. If picked up they will often regurgitate any food present in the stomach. They do fall prey to a variety of predators such as corvids, owls, storks, and probably other birds of prey but also mammals like foxes, badgers or domestic cats. Their lifespan in the wild is estimated at 15 years. The grass snake is a diurnal animal being active throughout the day, sometimes seen basking on trees in the lower branches or in a trunk fork. The grass snakes do hibernate during the winter colder weather, usually from September or October until March or April, using piles of rocks, rock fissures, compost piles or other decomposing vegetation. The species was first described as Coluber natrix by Linnaeus in 1758 and later reclassified as Natrix natrix by Stejneger in 1907. The species scientific name natrix derives probably from the Latin word "nare" or "natare" which means "to swim", referring to their superb swimming capabilities. Like with other snake species scientists don't alway agree about the number grass snake subspecies. Currently, the most commonly accepted number is 9 subspecies. The grass snake feeds mainly on toads, frogs, lizards, and newts but sometimes they will eat small mammals, birds, and small fishes. They may also on rare occasions eat ants or fish larvae and eggs. They are active hunters, actively searching for their prey, usually on the edge of the water in ponds, canals, streams, and rivers. 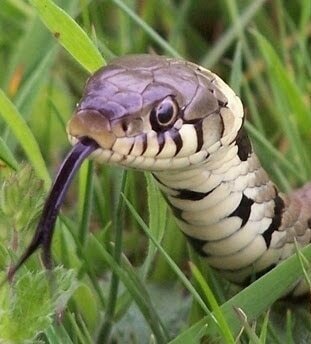 The grass snake relies on their keen eyesight and hearing and the sense of smell, known as the Jacobson's organ. Unlike other non-venomous snakes, they don't use constriction to kill their prey like other non-venomous snakes such as the boa constrictor. The unfortunate animal is just grabbed and then simply swallowed usually while still alive. They are capable of swallowing quite large prey relative to their size. After a meal, they will bask to increase their body temperature to help the digestion process. Captive grass snake will take live earthworms offered by hand, but not dead prey items. The mating season brings grass snakes together in large groups, usually a few females to a much larger group of males. As warmer weather approaches in the spring, males will emerge first followed by the females up to 2 weeks later around April or even earlier if temperatures are favorable. The grass snake mating season occurs from March to June, usually in 2 more or less distinct periods. The first from March to April when the snakes just coming out of hibernation shed their skin, and the other in the autumn just before they go into hibernation. Males curl their body around a receptive female, rubbing the female with his head while wrapping their tail around the female's body allowing for the copulation to happen. Females seem to be able to store the male sperm and choose the moment of fertilization according to environmental conditions. Females lay up to 50 white eggs with a leathery shell in June or July, grass snakes are Britain's only egg-laying snake species. Females search for a suitable nesting site usually in compost, manure or rotting vegetation or trees because the eggs need heat during the incubation period. The egg development depends on the temperature, but they usually hatch 6 to 8 weeks after they are laid. Hatchlings use their egg tooth to escape from the eggs by breaking the shell, these teeth are lost shortly after hatching. The newly born grass snakes are about 7 inches (18 cm) long and must be immediately independent from the moment of birth. While males mature at 3 years of age females only start breeding at 4 or 5 years old. After they reach maturity females shed their skin only once a year while males shed twice a year. The grass snake as a whole is classified as Least Concern species on the IUCN Red List. It is also protected in the United Kingdom by the Wildlife and Countryside Act. Although it is still fairly common in the UK they have become scarcer and are declining in numbers. 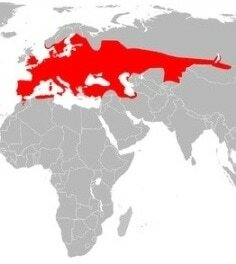 The species is also listed under Appendix III of the Bern Convention. Found in South America the green anaconda is the largest snake in the world.